Our popular Stick Stones get a golden face lift! These gold-colored stick stones are magnetic like their hematite-colored cousins. 3/4" long on their longer side. Our popular stick stones get some color! These stick stones have a peacock colored titanium finish that gives them a multicolored hue. The pieces are magnetic and will stick to ferrous objects as well as each other. Assorted size spherical magnets - range in size from 5/8" diameter to 7/8" diameter. Make great buzz magnets and are round enough to roll. round enough to roll. Price is per magnet. Sorry, no size selection. 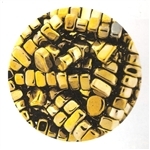 Assorted size gold colored spherical magnets - range in size from 5/8" diameter to 7/8" diameter. Make great buzz magnets and are round enough to roll. Price is per magnet. Sorry, no size selection. A pair (2) of large (35mm or 1-1/2") spherical magnets. Great for experimentation, doing the buzzing magnets trick or tons of other experiments. Useful for student demonstrations, plotting magnetic fields etc. Made from magnetic steel strips. Painted red/blue and stamped with N and S to indicate north and south poles. Supplied in pairs with cardboard separator and plated soft iron keepers. Size: 8" (200mm). Pair of 4" Long Alnico Bar Magnet. Excellent for educational work.